This bag is long overdue. I saw this material online and fell in love with it immediately. We see pheasants in our garden quite often, the quirks of living in the countryside. 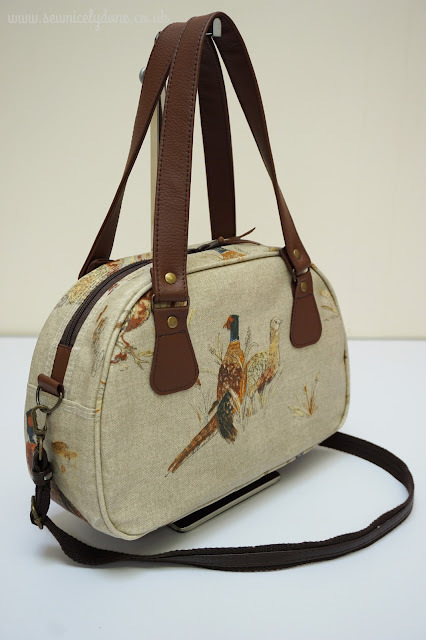 So when I stumbled upon this print one day, imagine my delight at the thought of being able to literally carry in your arms, the beauty of the countryside, everywhere you go. Just perfect! This bag however is not mine (although I am in the middle of making one for myself now). 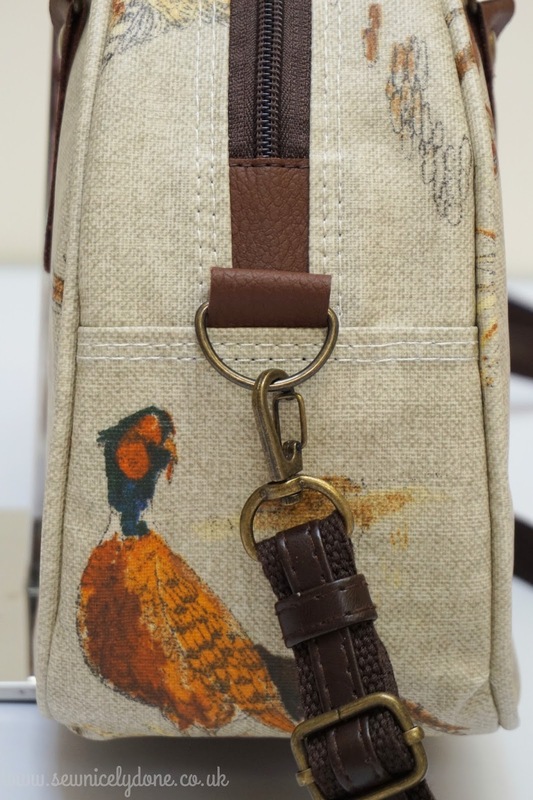 When this material arrived at the beginning of summer, my mother in law expressed her interest in having a bag made with this material, because like me, she loves pheasants too. But then summer holiday came, and my children had 8 and a half week long summer break, and I put all sewing aside to 'summer' with them. Now that they are back at school, and the autumn wind has filled the air with its chill, I think it's apt for me to start on this overdue project/request. The loud, vibrant summer shades are slowly replaced by more sedate colours to mark the change of season. 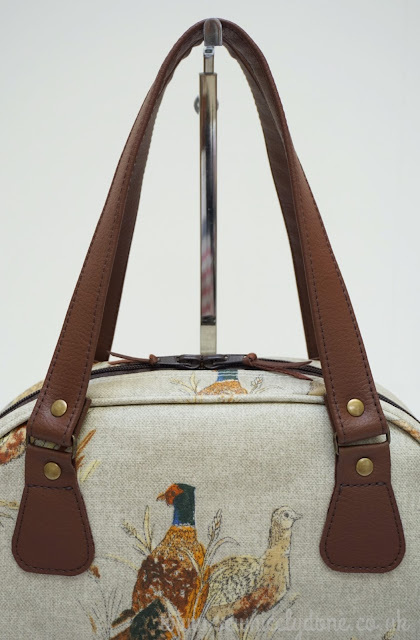 And slowly but surely the quilted wax coats and the tweed jackets will make their way out of the wardrobe, and will be perfectly complimented by this Minnie Bag in Sandringham Pheasant Matt oilcloth print. At 7.5 inches tall, 11.5 inches wide and 4 inches deep, I hope this will make a lovely shopping companion for my mother in law. I literally hit the ground running the day my children went back to school. I distracted myself with this project to stop myself from crying at the thought of how quick time flies and how fast my children are growing. 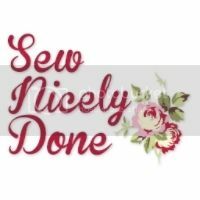 I refuse to be in the quiet, empty house and headed straight to the workshop to edit the pattern for my Minnie bag so it suits my more mature mother in law. Took me a few days through trials and errors but I am very pleased with the finished product. 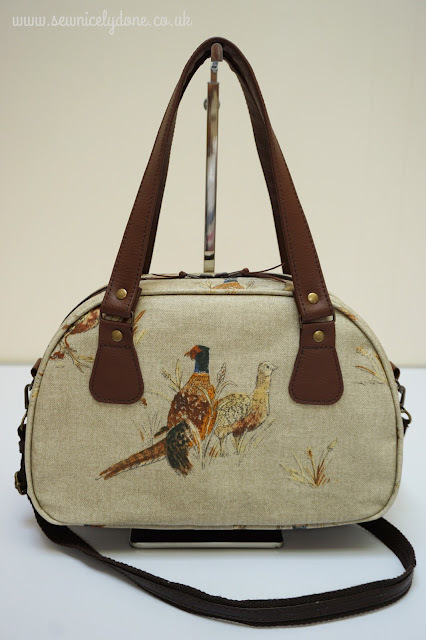 The bag design in itself remains the same, but I changed the way the handles were placed. I braved making these handles and connectors myself because I know exactly what I wanted, with the faux leather that I have in my stash, and I think the brown complimented the material well. 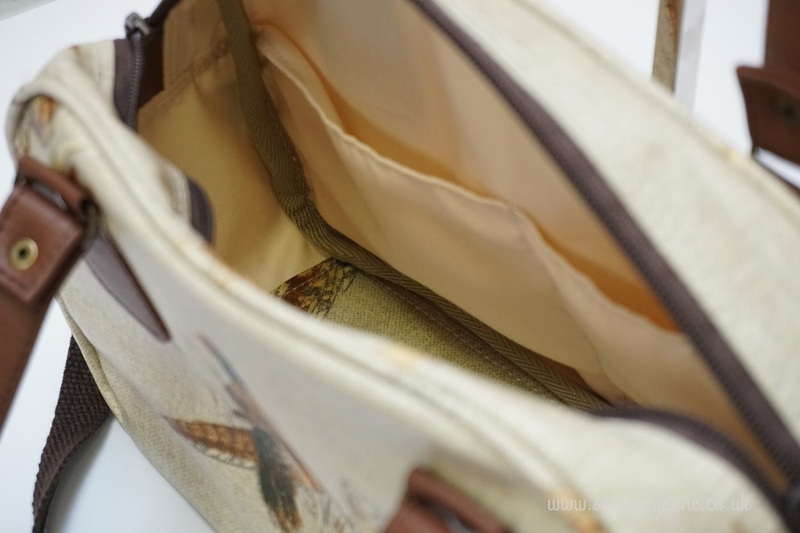 I also said a very quiet prayer before sewing the connectors on to the bag because this is the first time I've ever done this. I didn't want it to go wrong, although I was mentally prepared for a disaster (not a pessimist, just a realist). But with lots and lots of green tea sipping in between stitches, they were all placed perfectly. Alleluia!! 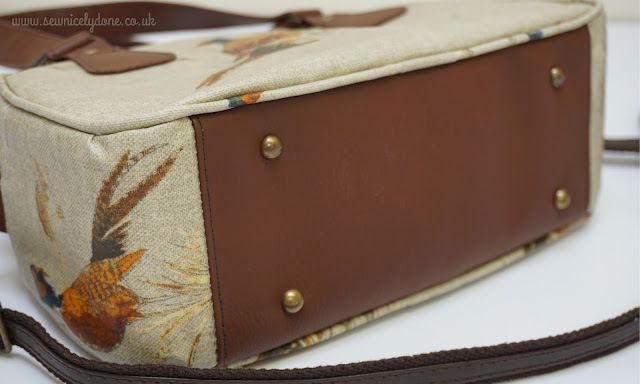 In my semi-professional bag maker's opinion, adding the handles with connectors just add a bit more dimension to a bag. Just an added element to give the bag a lift. 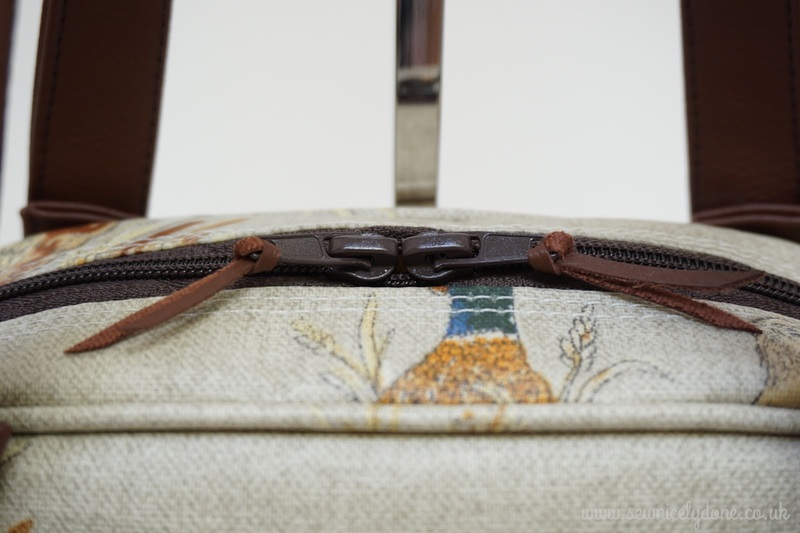 The riveting of the handles and connectors aren't just for show, they are actually there because it was physically impossible to sew where they are attached. Heavens bless whoever invented these rivets! Another addition to the bag were these simple tags to the zipper heads. The zippers functions perfectly without them, but the added tags makes it easier to reach for them. And it looks prettier (of course). I have also used the faux leather to make the tabs for the D ring, to which the detachable shoulder strap hooks on to. This was a last minute addition and I think it works brilliantly. If you also make bags, then you'll understand how much this reduces the bulk when joining all the pieces together this way. Makes sewing a breeze. Ok, this is when I made a boo-boo of the whole thing. When I cut the pieces, I made sure the pheasant was centred on the piece, not thinking about where the handles and connectors would go, hence the slight covering of the pheasan't head. This irked me to no end! So I suggested that this is the back of the bag. Problem not solved, but if I don't see it, it won't annoy me as much. The lining has two pockets so my mother in law can place her phone in it without the risk of it being scratched by the other contents of her bag. The other pocket is for car keys, because we all know that the inside of a woman's bag resembles an abyss where everything is lost and nothing can be found. And finally, I added feet to protect the bag bottom from the normal wear and tear. But you have to admit, it does make it look nicer too. 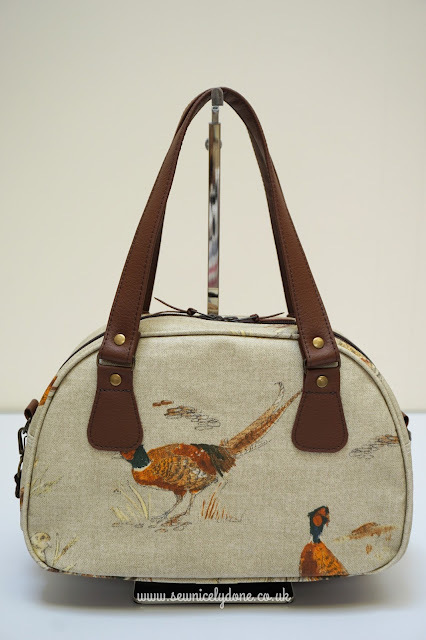 The Minnie bag, made with normal floral print oilcloth is priced at £42 + postage but should I ever need to repeat this pattern with this pheasant print material, this will be priced at £55 + postage instead. The need to centre the main print(s) on the bag pieces was very time consuming and also tricky. 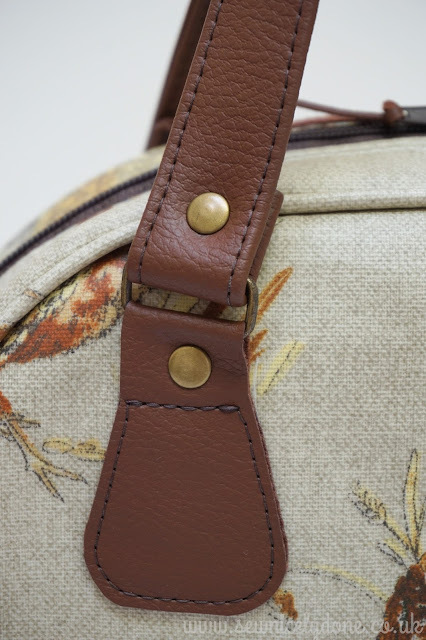 Every single element of this bag, apart from the metal hardware, was exclusively handmade by myself, which includes the carry handles and connectors, the strap and the piping. I absolutely enjoyed making this bag for my mother in law and I hope she loves the bag just as much. Once I finish making one for myself, I'll do another show and tell on here. In the meantime, have a lovely and resful Sunday ahead. It sure is good to be back sewing again! How absolutely lovely to have inspired you. I think with your skills as a seamstress, you'll be able to tackle a lot more than I could. I am self taught and everything I do is a result of trials and errors. Please share your make(s) when you have finished them. I would really love to see them.